The photo is of HMS MALAYA in a Floating Dock at Invergordon. The picture was taken just after the Battle of Jutland where the "Malaya", part of the 5th Battle Squadron of the Grand Fleet, received at least 8 "hits" from enemy ships. 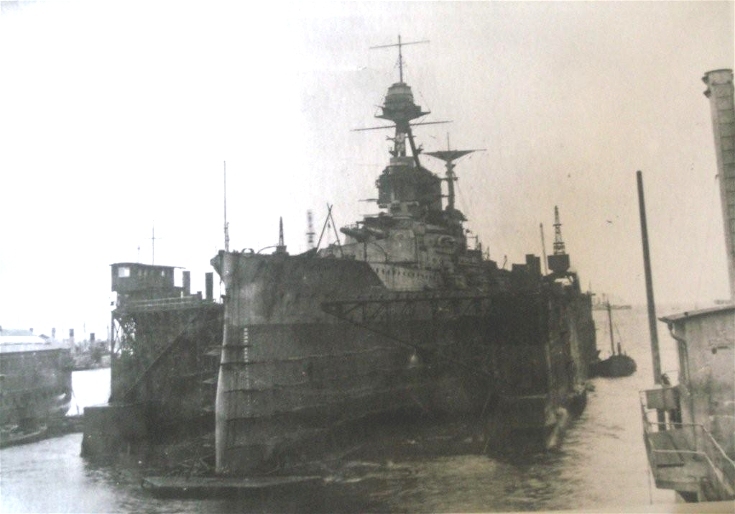 After the Battle, HMS Malaya put into Invergordon for repairs which took 8 weeks to complete (picture #1356 is a stern view of the ship). HMS Malaya was a "Queen Elizabeth" Class battleship built at Newcastle by Armstrong Whitworth, launched March 1915, commissioned in Feb 1916 and after a successful career in the Royal Navy ended her days by being scrapped at Faslane in 1944. This picture, as Duncan rightly points out, is the third of three showing HMS Malaya's arrival for repairs at Invergordon (picture #1360, picture #1362, then this one). It's interesting as it shows the Floating Dock almost fully raised with this end still just below sea level. The picture appears to have been taken from the vessel on the right foreground and judging by the details shown it looks like the smaller floating dock shown in picture #1348 and picture #1349. "Malaya was finally withdrawn from all service at the end of 1944 and became an accommodation ship for a torpedo school. Sold on 20 February 1948 to Metal Industries, she arrived at Faslane on 12 April 1948 for scrapping." picture #1362 and this one is surely not the same time, there's differences in the paint etc.